The Indian residential school system was created by the Canadian government in the mid-1880s and ran until the last school was shut in 1996. The goal of the residential school system was to educate and assimilate Aboriginal children into Christian, Euro-Canadian cultural norms and knowledge bases. Assimilation is a process of social integration that requires adopting, by choice or necessity, the ways of a different and often hegemonic culture or society. The majority of the schools were federally funded and run by various Christian churches. From 1920 to 1948, attendance was compulsory for Aboriginal children between the ages of four and 16. There were 139 federally funded Indian residential schools in Canada, 18 of which were in BC. Most of the schools were located off of reserve land, and forced the separation of children from their families, their communities and their land over long periods of time. In the residential schools, siblings were often separated to help break traditional habits, and by extension, family ties. Under the auspices of assimilation, speaking native languages was forbidden, even outside of the classroom, as was traditional clothing, food and other culturally specific habits or traditions. The children were punished if these rules were broken. As a result of this severe restriction of culture and heritage, many language skills and traditional knowledge was lost. Systematic physical, sexual and psychological abuse was widespread within the residential school system, as the testimonies of many residential school survivors have made clear. Poor nutritional standards and medical care contributed to a high mortality rate among children at residential schools. In fact, some schools had up to a 50% mortality rate. Many died of tuberculosis, pneumonia and malnutrition. The education in the schools was considered sub-par: despite the attempt to extinguish native languages in favour of English and French, literacy was not a primary goal of education in the schools, and students often only received up to a Grade 5 level of literacy skills. Instead, labour skills training was the main focus, including sewing and laundry work for women, and farming and carpentry for men. The systematic assimilation and forced movement of Aboriginal children off their land and away from their families is considered to be a form of cultural genocide. This process did more than just destroy ties to culture and land; the forced separation of Aboriginal children also left them without nurturing families, or the knowledge and skills to interact with and raise their own families. Consequently, the residential school system had far-reaching health, social and migratory effects. The high suicide rate among Aboriginal men for example, is attributed in part to the abuses that many people suffered in the residential school system. The forced and violent assimilation processes created a mistrust among social groups and perpetuated the fault lines between Aboriginal and non-Aboriginal people that exist throughout Canada. The last residential school to operate in BC was the Christie (Kakawis) Indian residential school on Meares Island. It was run from 1900 until 1983 by the Roman Catholic Church. 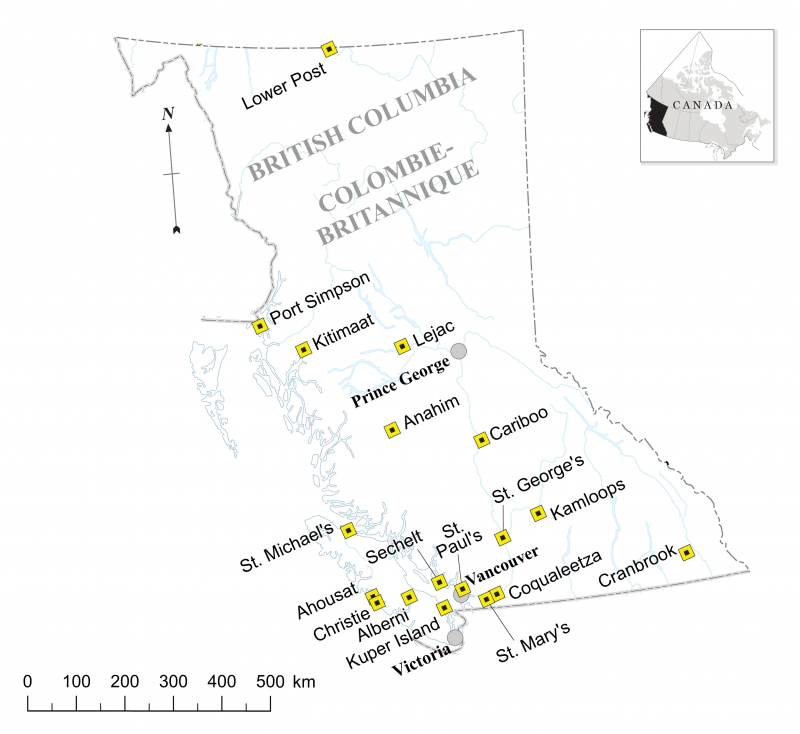 It averaged about 44 students at any one time, with most being from Ahousaht, Opitsat, Hesquiat, Nootka, Kyuquot, and the west coast of Vancouver Island. 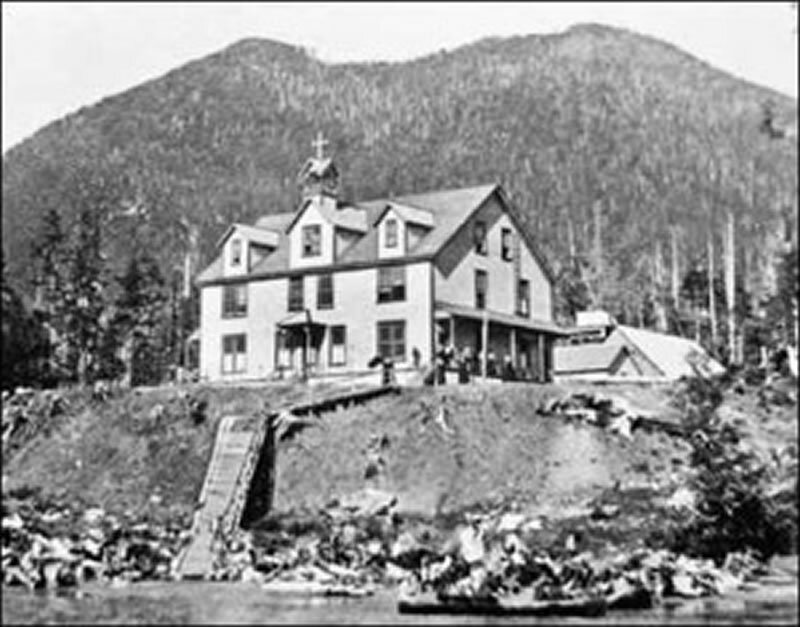 St. Joseph’s Mission in Williams Lake, another BC residential school, operated from 1890 to 1981, and at its busiest in the 1950s it had roughly 300 students coming from the surrounding Shuswap region. Unlike at the Christie school, parental visits were not allowed during the school year, and students were only allowed to return home for one month of the year. Over the course of the 1990s and 2000s, 23 charges of sexual assault were brought forward from former students against three individuals who had worked at the school. By the 1950s, the Canadian government could no longer deny that the Indian residential school system was detrimental to individuals and society more broadly. With reducing enrollments the schools began to be closed down, but it wasn’t until 1996 that the last residential school closed. In 1986, the United Church of Canada issued a formal apology for their participation in the system, followed in 1993 and 1994 by apologies from the Anglican and Presbyterian Churches of Canada. By this time many cases of abuse had been brought forward in the court systems across Canada. In 1998, the Government of Canada issued a Statement of Reconciliation, and the Aboriginal Healing Foundation was established. Between 1998 and 2005, many former students of residential schools brought forward a class action lawsuit against the Government of Canada asking for compensation for the abuses endured during the schools’ tenure. A settlement was reached in 2005 that set out a $1.9 billion compensation package and established the Truth and Reconciliation Commission. In 2007, the settlement packaged was finalized, and in 2008 the government finally issued an official apology for the residential school system. Of the almost $2 billion settlement, individual survivors could claim $10,000 for the first year of their attendance at a residential school, and up to $3,000 for each year of attendance afterward. However, it was deemed essential that the Aboriginals not only be compensated financially, but also have the full extent of the damage done be acknowledged within Canadian society, and to begin the processes of reconciliation and healing. The truth telling and reconciliation process as part of an overall holistic and comprehensive response to the Indian Residential School legacy is a sincere indication and acknowledgement of the injustices and harms experienced by Aboriginal people and the need for continued healing. This is a profound commitment to establishing new relationships embedded in mutual recognition and respect that will forge a brighter future. The truth of our common experiences will help set our spirits free and pave the way to reconciliation. To that end, the Truth and Reconciliation Commission has sponsored many events across Canada. Its goal is to prepare a comprehensive historical record, including hearing and documenting the truths of former residential school students, their families and communities. The commission sees the process of truth gathering as an essential part of ongoing reconciliation and healing. It is important to remember that reconciliation is an individual as well as a collective process. The Truth and Reconciliation Commission is a product of the Canadian government, and some contend that as long as there is ongoing oppression and systematic inequality of Aboriginal people, the reconciliation process cannot be completed. Along this line, it is important to think about how the commission is part of both an ongoing process of healing and an ongoing process of colonialism. Figure 3.2 Christie (Kakawis) Indian residential School on Mears Island (http://irsr.ca/photogallery/?wppa-album=20&wppa-cover=0&wppa-occur=1&wppa-photo=158) CC-BY-NC-ND 4.0 (http://creativecommons.org/licenses/by-nc-nd/4.0/) and used with permission from Indian Residential School Resources (http://irsr.ca/). Case Study 1: The Indian Residential School System by Geography Open Textbook Collective is licensed under a Creative Commons Attribution 4.0 International License, except where otherwise noted.